My family loves any recipes that have pasta in it, and I love coming up with new ideas to tempt them and see if my latest creation makes their favorite list! This delicious Sausage Garlic Parmesan Pasta recipe comes together in less than 30 minutes, and I can also make it for my family at a cost of less than $10. What is not to like about that? I love Italian Sausages and peppers recipes. The combination seems just perfect for each other and they are also very easy to prepare. Pasta dishes are hearty and savory, and make the perfect choice for the cool weather that has finally arrived after a long hot summer. Sometimes the meal just comes to me when I am shopping. I love Barilla pasta. It brings al dente perfection to any pasta meal, and is quick and easy to prepare. Johnsonville Mild Italian Sausage Links have a great taste with spices and flavors built right in. They make recipe prep easy and tasty, too. Since I wanted this meal to cost less than $10, I only needed to add a few extra ingredients. 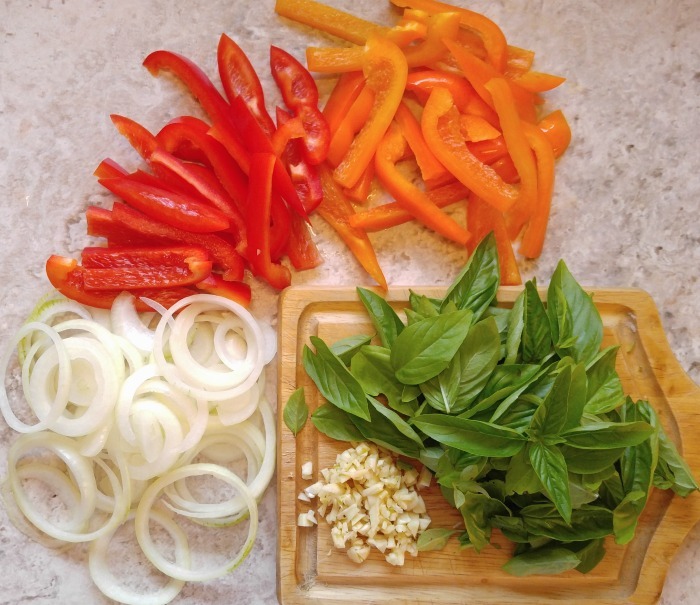 Sweet peppers, onion, garlic, the fresh basil that I have growing on my patio and some Parmesan cheese completed the ingredients. 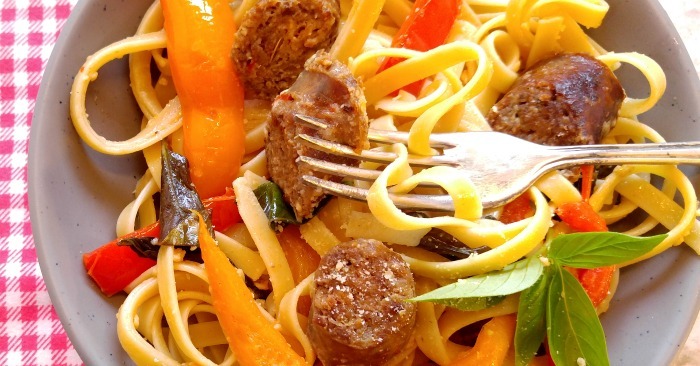 I can taste this Sausage Garlic Parmesan Pasta recipe already! Making the Sausage Garlic Parmesan Pasta. I started by cooking my sausage links in a deep sided nonstick pan and putting the pasta water on to boil. The sausage links got cooked to a nice golden color, and then I set them aside, cut them on the diagonal into rounds, and saved the same pan. While my sausage and pasta were cooking, it gave me a good chance to chop up all the veggies. LOOK AT THAT COLOR!! I drained off a bit of the oil in the pan and then added my veggies. Cooking the veggies in the same pan gives a lovely Italian sausage flavor to them and makes sure that the dish is just FULL of flavor. It also saves on clean up time later, which is a great thing! Once the vegetables are tender, I added in the cooked sausage rounds and drained fettuccine pasta. I also saved a cup of the pasta water to add liquid so the Parmesan will blend in well. The dish is almost ready and smells divine already! So garlicy and fresh!! Let’s add some fresh herbs! I have a big planter of fresh basil growing on my patio so I grabbed a good sized handful of it. 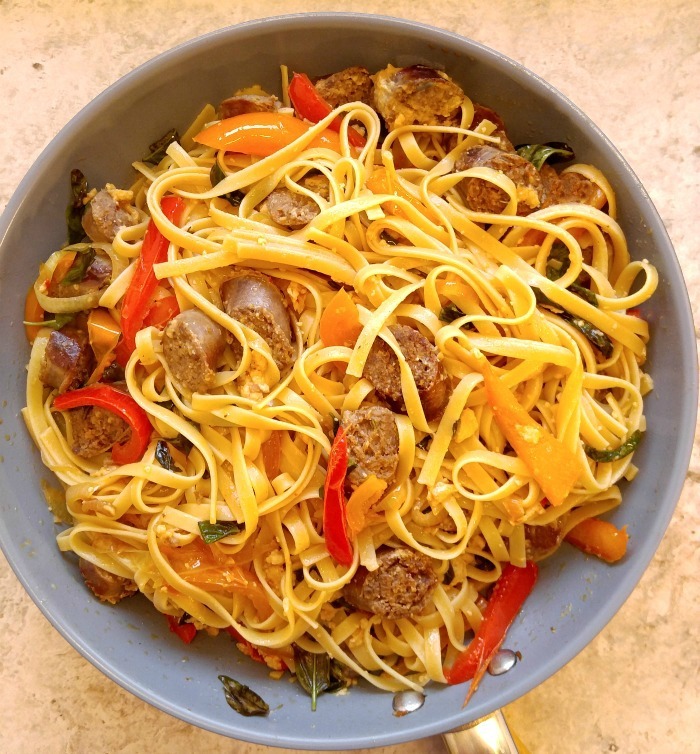 Since fall is here, the basil will stop growing soon, so this Sausage Garlic Parmesan Pasta dish is a great recipe to use it in. I added the leaves to the frying pan. A few minutes in the dish will make the basil wilt and add so much flavor to the dish.The last step is to stir in the Parmesan cheese, gradually. This step is important. If you add grated Parmesan all at once, it will clump, so go slowly, add a bit of pasta water and some cheese, mix well and add more cheese until it is all mixed in. Season to taste with sea salt and cracked black pepper and you are done! How easy is that? 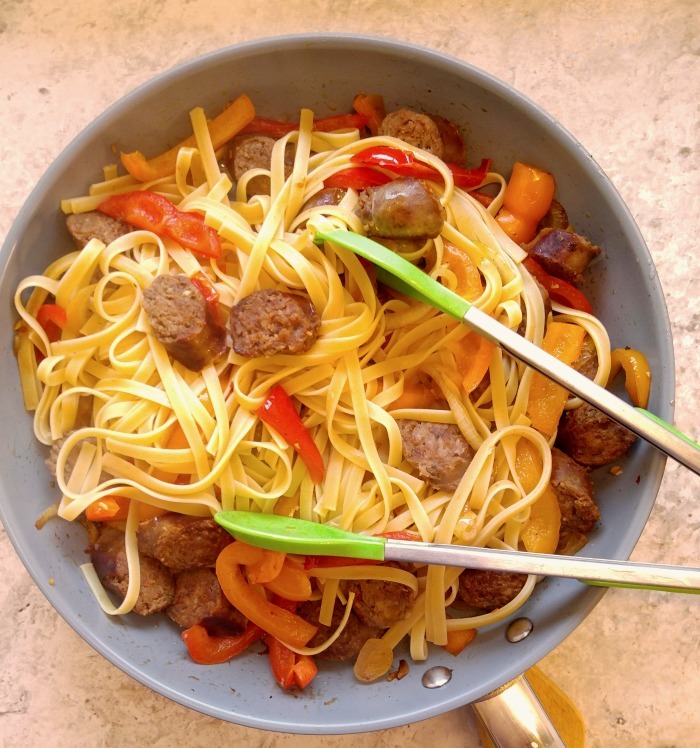 Every bite of this delicious Sausage Garlic Parmesan Pasta recipe is heaven! 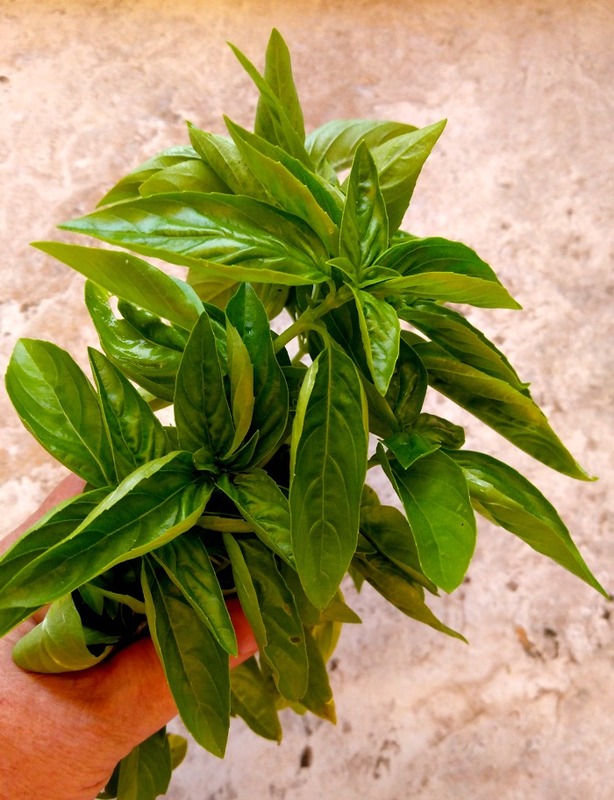 It is rich and cheesy with a lovely aroma of fresh basil. This classic dish is a hearty weeknight meal. 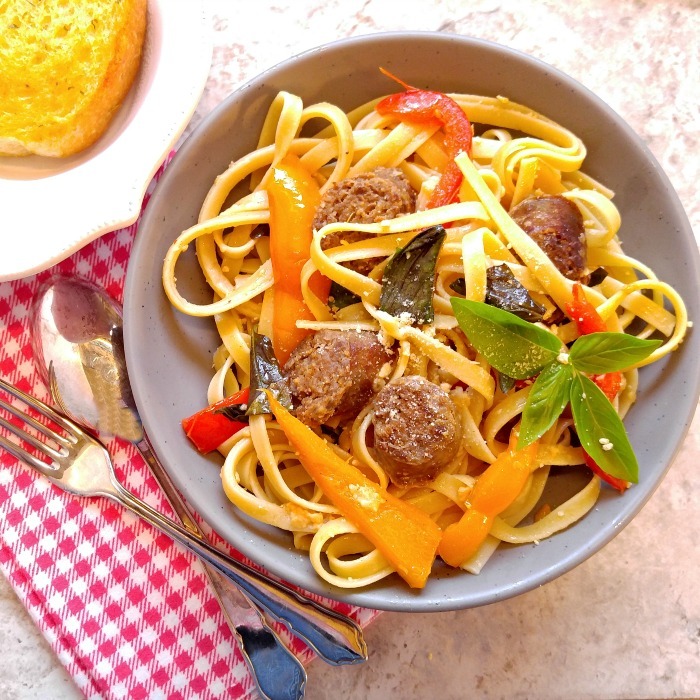 This Sausage Garlic Parmesan Pasta is full of delicious fresh basil, mild Italian sausage, garlic, onions, sweet peppers and creamy Parmesan cheese. It is hearty and gooey and SO, SO GOOD! 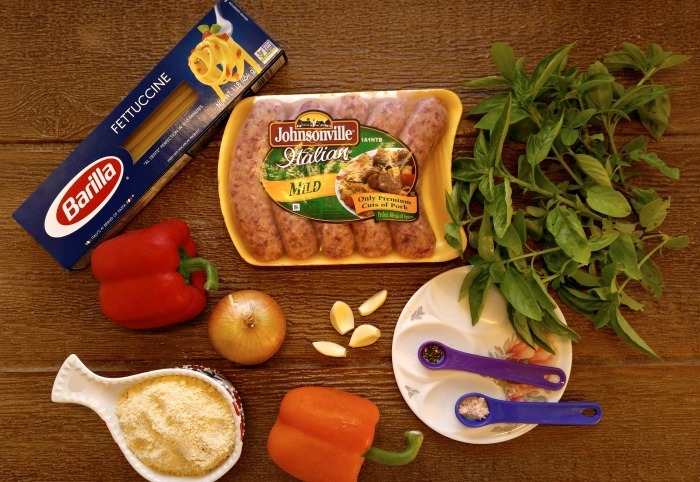 It gets a ton of flavor from the Johnsonville Mild Italian sausages, so that means you get to keep the other ingredients (and cost!) to a minimum, and still end up with a boatload of taste. This is a very versatile dish. It is easy enough for any busy week night but looks elegant so you can serve it when entertaining as well. Getting the dish on the table in less than 30 minutes for less than $10 makes this a recipe that I will want to share with my family often. A small salad and piece of herbed garlic bread completes the meal. 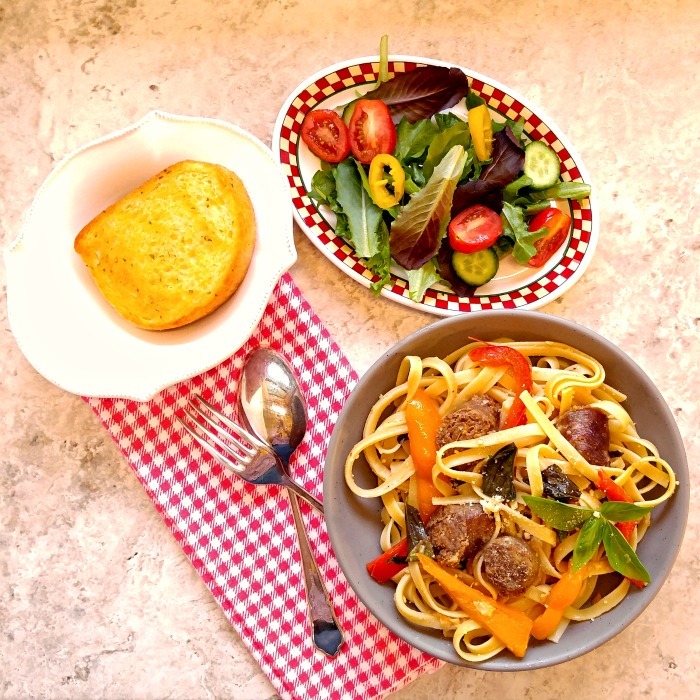 Would you like to make this Sausage Garlic Parmesan Pasta for your family? Head to your local grocery store, pick up some Barilla pasta and Johnsonville Mild Italian sausage links, and add your other ingredients and you will be all set. Get ready for some rave reviews from your family. I am sure they will tell you this is one of their favorites! How great is that I was able to feed my family a nice dinner for under $10? Do you have a favorite quick and inexpensive dinner that you make on busy week nights? I’d love to hear what you make for your family in the comments below! This delicious Sausage Garlic Parmesan Pasta recipe comes together in less than 30 minutes, and I can also make it for my family at a cost of less than $10. 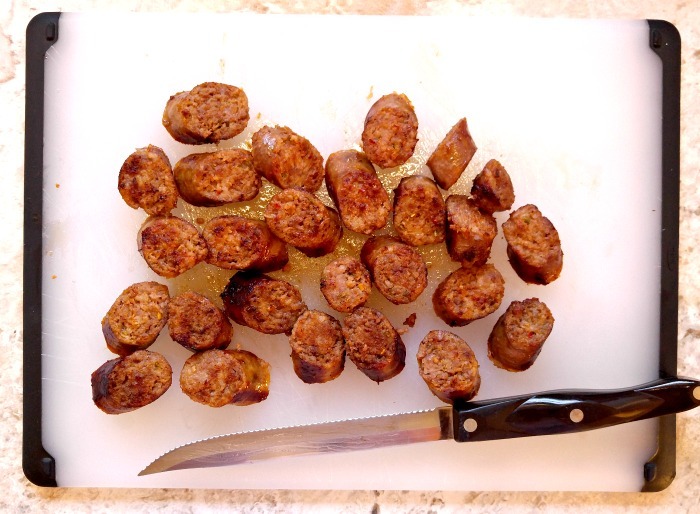 Place the Johnsonville Mild Italian Sausage Links in a nonstick frying pan and cook until done. Slice the sausages into rounds and set aside. While the sausages are cooking, place some salted water on to boil and cook the fettuccine. Drain the pasta when done but reserve a cup of the pasta water. 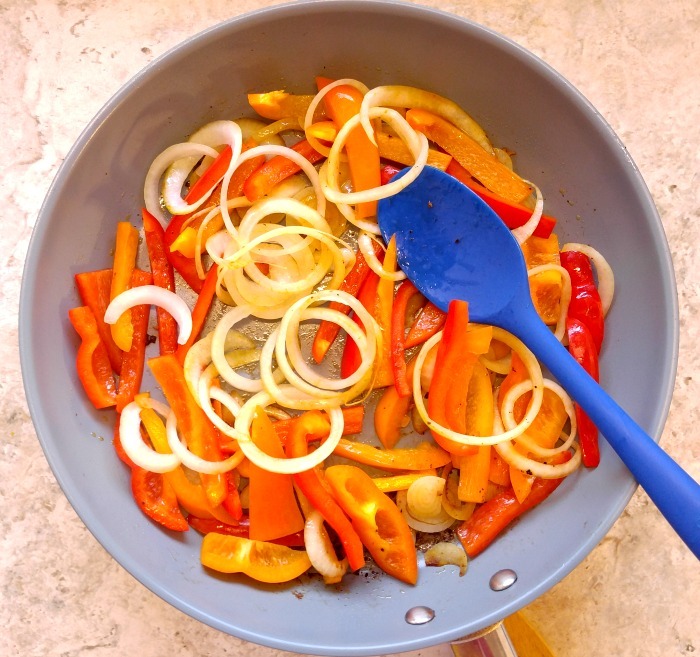 Place the onions and peppers in a the pan that was used to cook the sausages, and cook gently for 2 minutes. Add the garlic and cook for another minute. Add the cooked sausages and drained fettuccine pasta and mix well. Stir in the fresh basil leaves, give it all a good swirl and season with sea salt and cracked black pepper to taste. Very gradually stir in the Parmesan cheese, and reserved pasta water until it is all mixed in an creamy. Immediately spoon into serving dishes. Serve garnished with some extra Parmesan cheese and minced basil. Enjoy!